This complete DJ system is all about big house sound! Mobile DJ's make this system incredibly popular. Feel the music with tight, punchy lows and crisp highs. It doesn't get any better than this. 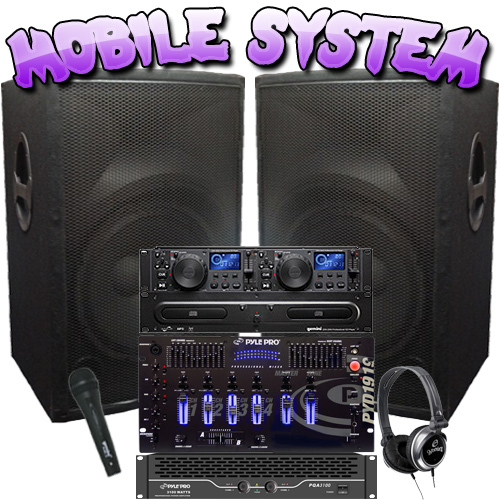 This system is complete with everything you need including two huge 12" speakers, a 2100 watt power amplifier, dual cd player, DJ audio mixer, DJ case and all the wires you need. The EAP-12D is all about big house sound! Gigging Bands, Karaoke, Mobile DJ's, Night Clubs and houses of worship make this speaker incredibly popular. Easy-to-handle cab features computerized, high-precision, environmentally friendly woodworking; large handles; corner protectors and balanced acoustic design. Tight, punchy lows come from bass reflex technology while crisp (not brittle) HF response is generated by a new 1" titanium driver with 90 degree by 40 degree non-resonant horn. Loaded with a beefy 12" premium woofer with a 2.5" voice coil for pumping plenty of low end punch. These speakers deliver premium quality sound night after night. This rack-mountable professional power amplifier packs a huge punch – 2100 watts of maximum power. This amplifier is equipped with dual ¼” and RCA inputs as well as dual speakon, ¼”, and banana plug outputs. The dual output level controls allow you to tweak your levels to your exact specifications. The soft start limiter prevents turn-on damage to your speakers. It’s all powered by a high quality ring transformer that eliminates transients and maximizes sound quality. Run in stereo, or bridge with another amplifier for even more power. This rack-mountable professional dual CD player with jog dial is a must-have for total control over playback of CD-based audio. With 8x over-sampling and a 1-bit D/A converter, this unit plays back your audio with crystal-clear quality. This two part system has a control unit and a dual CD player unit. Take total control of your mix with the dual jog shuttle wheels, separate track skip and search buttons, AUTOCUE function, pitch speed control, and loop function. Great for basic DJing. Use the relay function to switch between the two CD drives. Includes both analogue RCA and digital RCA (SPDIF) outputs. Runs on 110 / 220 V AC.